The first all-glass residential tower at the Seaport, Manhattan's oldest new neighborhood, offers an unprecedented waterfront lifestyle with sky-high amenities and picture-postcard views. Directly overlooking the waterfront, the 60-story tower contains an exclusive offering of homes designed by Goldstein Hill & West Architects. The custom engineered glass walls dynamically reflect the hues of the sky and the river. Residents arrive home to the only private attended Porte Cochere at the Seaport, which leads to a two-story lobby with a 24-hour concierge. The Piano Nobile Lobby Lounge features a double-sided fireplace, dramatic lighting installation and waterside terrace. 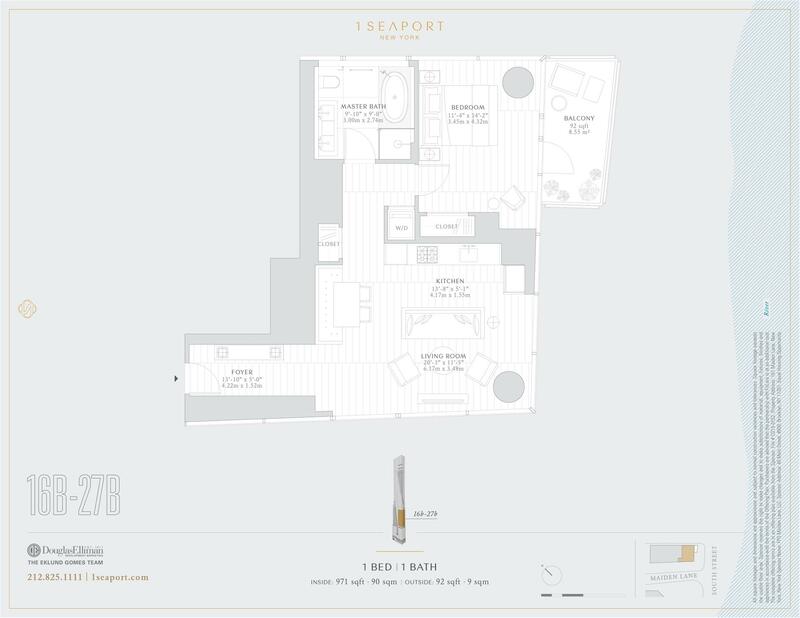 Two levels of amenities designed by Groves & Co. overlook the river. Spanning the entire 30th floor, The Water Club is a restorative hydrotherapy circuit with a floating glass edged infinity pool, a digitally activated rain shower, a relaxation lounge and glass enclosed steam and sauna retreats all surrounded by the scenic landscape of the New York harbor and downtown Brooklyn. The sixth floor fitness center contains an extensive range of state-of-the-art cardiovascular equipment with studios for spin, yoga and personal training. An exclusive partnership with FitLore offers each resident access to a fitness concierge, on-call spinning and training sessions and a la carte private culinary services. Adjacent to the fitness center is the SmartKids playroom, where technology and design created an immersive experience.